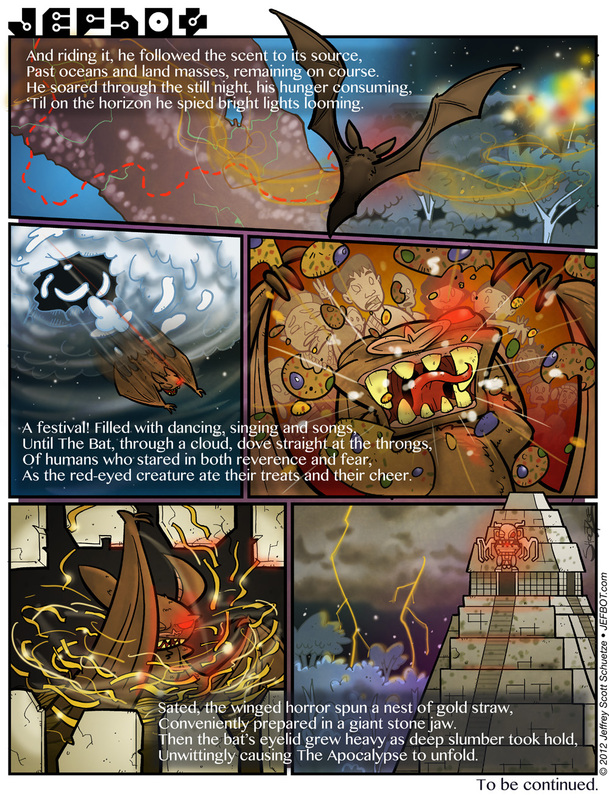 The Christmas Bat story continues after our furry fiend was lured to Central America in Part 1! And 12/21/2012 – the day of the Mayan Apocalypse – may have come and gone for us, but in the Christmas Bat’s universe, Doomsday still looms. And now that our crimson-eyed villain has inadvertently set in motion the End of Days, there’s no telling whether or not the planet will ever see another Christmas! Tune in at the same Bat Time (err, next Tuesday) and on the same Bat Channel (JEFbot.com) to find out what happens next! Ugh. Really wanted this strip to go up sooner, but between the hustle and bustle of Christmas, fulfilling BOTshop orders, New Year’s Day around the corner and these comic-page sized Christmas Bat strips, I’ve been short on time, lately! Not that I’m complaining – I love that the Holidays and JEFbot are keeping me busy, but rest assured, I’ll be caught up on shipping this Saturday (there’s still time to get the FREE Holiday BOTton if you order before Dec. 31st! ), and should have enough time to get the next Bat strip up by next Tuesday. Thanks, as always, for your patience and understanding! I am honestly surprised that the christmas bat isnt an internet meme yet. Its awesome and the rhymes are sweet! aWWWww… thanks, DAS! for now, i’m just happy y’all like seeing the holiday return of the Christmas Bat every year. but i’d love for him to be a tradition in as many households as will have him! LOVING. THIS. I don’t suppose that you’ll be collecting these stories and either putting them in their own book or making them an extra in the next JEFbot volume? domo arigato, reynard61! i’ve thought about how i’d collect these stories and i’d probably do it in a single book (although i’d have to wait a few more years to make it substantial) and then include an exclusive TCB story as a special incentive for the fans to pick up. would love to make this happen! and they even warned us, CE! but we did not listen! WHYYYYYYYYY!!!? Fear not! Christmas Bat will flap his wings and fight chaos with chaos. ohhhhh, I like where this is going! glad you’re diggin’ it TPC! YAY! Wait I mean…CRAP! What’s going on?! you’ll find out soon, Pixie! and Happy New Year to you and yours, too! Working the apocalypse into this year’s Christmas bat story. Great! i couldn’t resist! thanks, Rainey! NOOOooooooOOOOOoooooooo….. I’m on pins and needles!!! Love it!! As a Central American(Honduras) I find this hilarious. Question, how is it that he triggered the apocalypse? And how did he got that gold straw, he made it like Rumpelstiltskin or he found it? I always new a bat would cause the end of the world. your feelings were right, 52pickup. they were right. Unvitingly? HA! He sooooooo caused Apocalypse on purpose.